There are few things more exciting to your pooch than going on a walk. Now, if you want the outing to go without a hitch, you need the best possible dog harness. As you have probably already realized, it isn’t easy to get your hands on a quality dog harness. This is because when looking for a dog harness, you have to think about comfort, fit, design, and durability. It can be rather difficult to find harnesses that fit all these criteria. So, we took on the challenge ourselves and came up with some products that will live up to your expectations. To top it off, we also added a buying guide so you would be better equipped to choose your own products. The harness on this product is made from denim which solves two very important problems for you. First off, the material is strong and durable, so it will not rip; especially since the harness is made up of two layers. The other perk with this material is that while being strong, it is also gentle against your dog’s fur and skin, ensuring that it feels comfortable. This way, your dog will be less likely to try and get it off. You can also tell that it is long lasting by the thick, heavy-duty stitching around it. This makes certain that your pup will not be able to tear it apart at the seams. The harnesses are also available in three separate sizes, so you should be able to find a good fit for your dog, regardless of whether they are small, medium, or large in size. This dog harness has adjustable buckles and features so if your pup is one of those in-between sizes, you should still be able to make do. The only real disadvantage with this harness is that some dogs have a tendency to escape it. So, if your dog is something of an escape artist, this harness may not work for him. The leash accompanying this harness is sufficiently long enough so that your furry friend is allowed to explore his surroundings while still staying on the path. If you have an active, large pooch then this harness really could come in handy for you. One of the key features of this harness is the design. See, it has been specifically constructed for dogs who pull on their leash while on a walk. This particular design ensures that the force generated by the pulling is evenly distributed around the body so that your pup will not be at risk from choking. It also makes it easier for you to rein them in when they decide to take off at a faster pace. Even if you do have an energetic pup, you can be certain that this harness will be a good option for them. It is made from strong Oxford nylon material that won’t tear or get damaged easily. At the same time, it is also incredibly soft and padded. So, your pup will not have any discomfort while they are wearing this harness. The only weak point of this harness is the D-ring where the leash is attached to the harness. This can snap with some pressure so you should keep an eye on that if your dog is prone to sudden sprinting. On the other hand, all of the buckles on this harness are quite sturdy, ensuring that the harness will remain on your pooch at all times. What’s more, they can be snapped into place easily. There is a lot to like about this harness, including the fact that it is made for dogs of all sizes. This harness has sizes ranging from extra-small to extra-large so you should have no trouble finding the right size for your pup. You should be aware that while the fit might be great, this harness that can shift around on your dog’s body, depending on how fast they walk. So, you should check to see that this movement isn’t worrying them in any way. It also works well for more energetic dogs. The harness has been designed so that it distributes the force and weight of your dog evenly. This means that even if your dog pulls on its leash, you don’t have to worry about their throat or chest getting squeezed in the process. There are two sturdy leash attachments at the back that can secure your leash to the harness properly. This feature can make it a bit easier to manage your dog’s pace too. Now, the material that this harness is made from is strong, thick, and durable. However, it is also lightweight and well-padded. So, your pooch will have no qualms about keeping it on, even for longer periods of time. If you want a dog harness that is going to last you a while, then this is a good option. 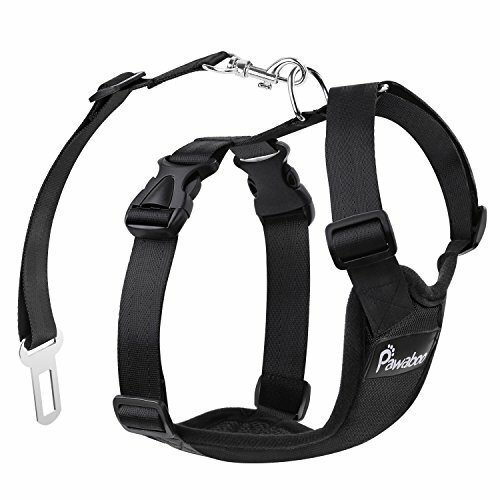 One of the main perks of this harness is that it is made from incredibly durable materials. The harness is made from Oxford material which isn’t just strong, but also scratch-resistant. As a result, you get to ensure that your harness stays in good shape for as long as possible. There are lots of padded areas on this harness which allows your pup to stay comfortable during the entire time he wears the leash. To add to this, the leash attachment points and various other features are also made from sturdy materials. 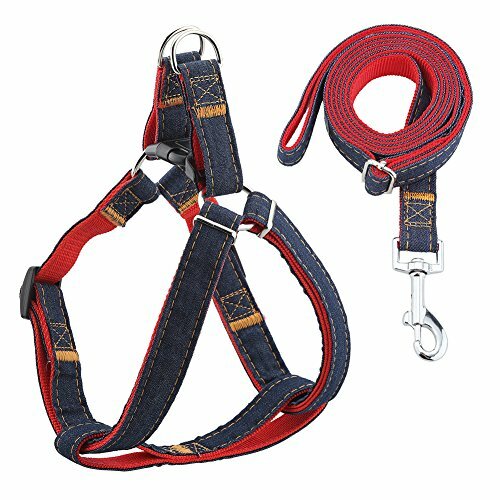 Now, this harness offers a variety of sizes for dogs of all breeds. You can choose sizes ranging from extra-small to extra-large. There are also features that allow you to adjust the harness for a better fit. You should know that these are a bit cumbersome, especially if you are trying to make the adjustments while your pooch is wearing the harness. 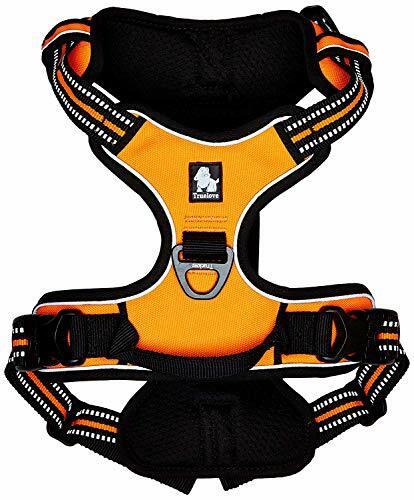 This harness has also been designed to prevent any pressure being placed on your pooch’s neck. So, if they have a tendency to pull when they are on walks, you can rest easy knowing that they are safe. 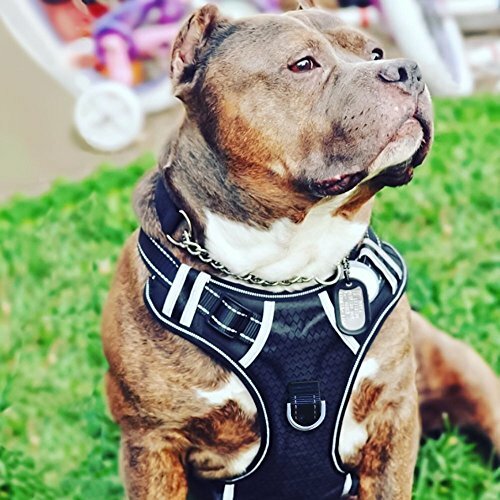 What stands out about this harness is that it is great for walks as well as if you want to take your pup on a car ride. This is because the harness has been designed to quickly and easily be compatible with a wide range of seatbelt ports. So, you can easily take your pooch for a drive and then a walk without having to make too many changes. Since this harness is available in sizes ranging from small to extra-large, you shouldn’t have much of a problem finding a good fit for your pooch. This is made even easier thanks to the various adjustable buckles and features on the harness. The only issue is that if your pup has a tendency to pull on its leash during a walk, the harness can loosen. So, you will need to keep checking on this from time to time. The good news, though, is that the harness is made from highly durable Oxford fabric. So, you can utilize it for as long as you need and not be afraid that the leash is going to tear from continued use. Thanks to the sponge and padding, you can also be quite sure that this harness is incredibly comfortable for your pooch to wear. There are three styles of dog harnesses to choose from, depending on what you are looking for in such a setup. The different types of harnesses are back-clip, front-clip, and tightening. These refer to the placement of leash attachment feature on the harness. Back-clip Harness: with these harnesses, the leash attachment feature is placed on your dog’s back. These are quite popular as they are comfortable for most breeds to wear and there is no danger of the leash getting tangled up in their legs. However, this type of harness works best for calmer dogs as they don’t offer a great deal of control over your pooch. 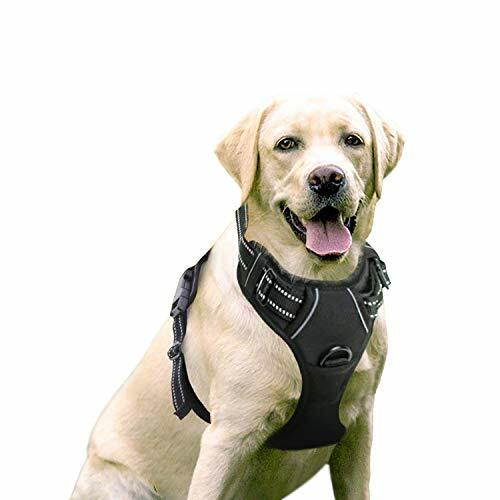 Front-clip Harness: these harnesses are for dogs that haven’t been trained to walk calmly yet. Since the leash attachment is at the front, you have better control over your pooch’s stride. They also make it easier for you to steer your dog where you want it to go. The downside of these harnesses is that you have to be very careful about leash slack. If it is too much, the leash can get tangled up under your dog. Tightening harness: these types of harnesses are typically used when training your dog. Whenever your dog pulls forward, the harness tightens a bit so that your pooch knows not to try it again. The main disadvantage of these harnesses is that they can be rather uncomfortable for your dog to wear. Once you have decided on the type of harness, you will then have to figure out whether you want a step-in or overhead harness. With the step-in, your pup’s paws are fitted through two straps and in the overhead design, you have to get the straps over your dog’s head and neck. When it comes to deciding between the two, it really is more to do with just how well your pooch responds to each harness. For instance, you may find it a bit difficult to get an energetic dog to place their paws where they need to go with the step-in harness. On the other hand, your dog may find that an overhead harness is just a little too restricting. First and foremost, you need to make sure that the harness you buy fits your pooch. If it is too small or large for your dog, it really won’t be of much use to you. It should be noted that most manufacturers have their own guidelines for sizing. So, it isn’t wise to follow S, M, L, and XL. Instead, when fitting your pup for a harness, always look at the chest and waist measurements provided by the manufacturer. Compare these to your dog’s dimensions and determine whether they will fit. While there are typically adjustable features available with harnesses, make sure that you have a good fit. It is incredibly important that you always check the design on the harness you want to buy. You need to make sure that all the straps are wide enough and will not dig into your pooch’s limbs. The front feature of the harness should also be able to distribute force and weight evenly to avoid bunching around your pup’s throat. This way, you can be certain that the harness will not press against your dog’s throat or windpipe should they pull on their leash. Now, the material on your dog’s harness is significant for two reasons. Firstly, it should be soft and comfortable so that it doesn’t chafe against your dog’s fur and skin. Secondly, it should be strong enough so that it won’t rip or tear easily, thus ensuring longevity. It can be tricky to find such fabrics but usually, good-quality nylon should do the trick. However, if your pooch is sensitive to synthetic materials, you may need to find a harness made of natural fabric. Another thing that you will need to consider is the padding. There are certain parts of your dog’s skin that are prone to chaffing or irritation. So, to avoid this, you should really consider a padded harness. Most dogs are energetic and love to run around. This means they will put their harnesses through some serious wear and tear. So, unless you want to spend a considerable amount of money on dozens of harnesses, take care to choose more durable options. Apart from the fabric, you should also look at the stitching. Make sure the thread is sturdy and good quality and that the stitches are thick and well-placed. You should also examine other features like the buckles and D-rings to make certain that they will not give away too easily. To wind things up, when looking for a dog harness you should always examine the fit, material, design, and durability before making your decision. If you are looking for more affordable options, you should consider the Pawaboo or URPOWER dog harness. For smaller dogs, the RABBITGOO harness may be more suitable while the Babyltrl harness may be a better fit for medium-sized to large dogs. For a comfortable and functional option, you should go with the Chai’s Choice harness. So, there you have it, all the information that you need to make a great decision regarding which dog harness to buy.